Charles Goodwin, by any definition, has lived an incredible and varied life. He has both dined with the rich and famous, and in search of the true spiritual Masters of India, has tramped barefoot through the streets of villages in the Indian sub-continent. Charles Goodwin was born in Kent, England in 1948. In 1954 he moved with his family to Australia. From an early age, Charles was drawn to the rather unusual combinations of Eastern (and Western) mysticism, spirituality and wealth creation. Even as a child, he loved spirituality yet found creating wealth so easy. "I remember a marble craze hit our school. I was about nine years old at the time. Within a few days I had constructed a long cardboard box and cut out nine "mouse" holes along the base down one side. The center small hole had the number ten written above it. The corresponding larger holes to either side had the numbers, 5, 3 and 2 above them. The idea was, that if the player rolled his marble from a pre-designated chalk line, and it went into the smaller 10 hole then that player had won ten marbles. If the marble went into a larger 2 hole, the player won two marbles and so on. The marbles that failed to enter a hole I kept. Naturally, I sold the marbles back to the players once they had lost all of theirs. The idea was a smash hit. Even a few of the teachers, including the vice-principal, joined in." "Those were such innocent days. Without knowing it at the time, I was running a sanctioned school casino. The marbles I sold were the casino chips. Within a few weeks, I had two wheat bags full of marbles and was making, what was then, a small fortune." In his mid twenties, Charles became a multi millionaire - achieved at pre-inflationary times when a million dollars was worth several times more than what it is worth today. By his early thirties he drove a Rolls Royce, owned well over a hundred properties, including a sixty square mile farm, and lived in a mansion. For over a decade, Charles lived the high life. The "debt free" wealth program outlined within The Secrets of Wealth Creation Revealed has been especially created so that both lowly paid and highly paid individuals, can experience true freedom via the pathway of securing abundant wealth. Charles Goodwin advocates wealth creation without materialism Wealth with integrity - wealth without guilt, fear or attachment. He urges and challenges us to walk through life upon the path of the Master, rather than the conditioned and limited path of beliefs, intellectual concepts and conditioning. His message is to go beyond the ego self and to awaken and to realize our higher selves. Yet Charles Goodwin has his feet firmly planted on terra firma. His wealth program is both revolutionary and absolutely practical. His aim is for you to experience fantastic wealth. Charles is also an adventurer at heart and loves traveling. His hobbies, besides writing, include oil painting and song writing. Charles has just finished his latest book called The Cauldron - a fascinating and "supremely scary" love story drawn from his incredible mystical experiences. 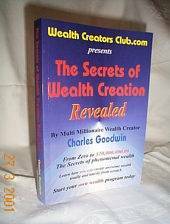 The Classic Wealth Creation Book Everyone should read!